It is best to defer making this sweetmeat (which will be found very fine) till late in the season when lemons are ripe and are to be had in plenty. Pumpkins (as they keep well) can generally be procured at any time through the winter.Take a fine pumpkin of a rich deep colour, pare off the outer rind; remove the seeds; and having sliced the best part, cut it into chips of equal size, and about as thick as a half dollar. They should be in long narrow pieces, two inches in breadth, and six in length. It is best to prepare the pumpkin the day before; and having weighed the chips, allow to each pound of them a pound of the best loaf-sugar. 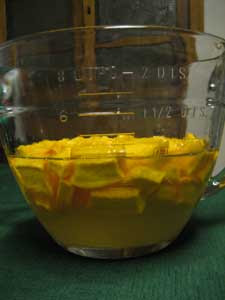 You must have several dozen of fine ripe lemons, sufficient to furnish a jill [gill = 1/2 C] of lemon-juice to each pound of pumpkin. 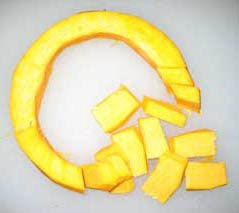 Having rolled them under your hand on a table, to make them yield as much juice as possible, pare off the yellow rind and put it away for some other purpose. Then having cut the lemons, squeeze out all the juice into a pitcher. 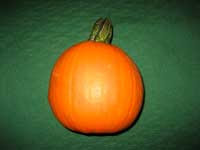 Lay the pumpkin chips in a large pan or tureen, strewing the sugar among them. Then having measured the lemon-juice in a wine-glass, (two common wine-glasses making one jill, [gill=1/2 C]) pour it over the pumpkin and sugar, cover the vessel, and let it stand all night. Next day transfer the pumpkin, sugar, and lemon-juice to a preserving kettle, and boil it slowly three quarters of an hour, or till the pumpkin becomes all through tender, crisp, and transparent; but it must not be over the fire long enough to break and lose its form. You must skim it thoroughly. Some very small pieces of the lemon-paring may be boiled with it. When you think it is done, take up the pumpkin chips in a perforated skimmer that the syrup may drain through the holes back into the kettle. Spread the chips to cool on large dishes, and pass the syrup through a flannel bag that has been first dipped in hot water. When the chips are cold, put them into glass jars or tumblers, pour in the syrup, and lay on the top white paper dipped in brandy. Then tie up the jars with leather, or with covers of thick white paper. 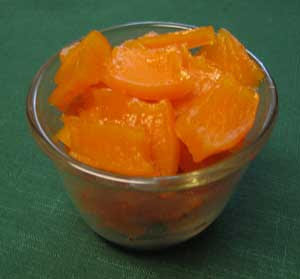 Shave your Pompion thin with a plain and cut it in slips about the width of your finger, put shreds of Lemon peal among it, wet your sugar with orange Juice and boil it into Syrup. Then put in your chips and lemon Peal and let them boil till done. A Colonial Plantation Cookbook: The Receipt Book of Harriott Pinckney Horry, 1770. Columbia: University of South Carolina Press, 1984. The chips soaked overnight will shrink considerably, 4 cups become 2 cups, then boil the mixture until chips are clear.